The website of the Greek Orthodox Archdiocese of America is managed by the Department of Internet Ministries. This site offers a vast selection of inspirational, educational, multimedia, and interactive content on the Orthodox Christian faith and life. This site is a resource for Orthodox Christians who wish to learn more about their faith; for non-Orthodox who desire to learn more about Orthodox Christianity, and an indispensable resource for those involved in ministry at any level. Most importantly, it serves as an essential ministry to our faithful and a vital evangelistic medium for spreading the Good News of our Lord and Savior Jesus Christ. We are proud that this site both reflects and continues the department's mission and tradition of using technology, the Internet, and multimedia to proclaim the Gospel to the whole world. Online Chapel: The most exciting section of the Archdiocese website, the Online Chapel section expresses the rich liturgical tradition of the Orthodox Church. It provides inspirational spiritual content for Orthodox Christians including live broadcasts of liturgical services, an online calculator for determining the date of Easter and moveable Feasts, the lives of the Saints, the texts of the daily Scripture readings, prayers from the liturgical tradition of the Orthodox Church appropriate to the time of day that you visit the site, and a weekly reflection. Orthodox Calendar: The online calendar lists the saints commemorated for each day of the year with a link to the life of the saint commemorated. It also functions as a fasting calendar for the entire year, marking which days in the year are fast days or fast free days. 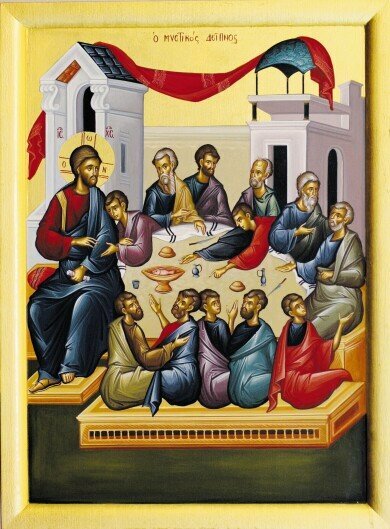 Finally, the calendar lists all the major feasts of the Orthodox Christian Church including Pascha (Easter). Parish Directory: How can you find the nearest Greek Orthodox parish? The online parish directory allows individuals to find any Greek Orthodox parishes in the United States. This parish directory features searching for parishes by zip code, an online map of a parish's location, and driving directions. Learn to Chant: The rich hymnographic tradition of the Orthodox Church is brought online so that you can learn the various hymns in Greek and English. Visitors to the site can listen to and learn the hymns of the Divine Liturgy and the Sunday Orthros services online. This section is complemented with the complete texts of these services in English. Multimedia: Over 60 full-length educational videos on the Orthodox Christian faith, live Internet broadcasts of church services, virtual reality tours of churches, distance learning classes, and online radio programs highlight this expanded section. Our Faith: Individuals wishing to learn more about the Orthodox faith will find dozens of articles covering a variety of topics such as biblical studies, apologetics, spirituality, theology, and worship. Ministry Outreach of the Archdiocese: Assistance for spouses, couples, and families of interfaith marriages; the philanthropic work of the Archdiocese; foster care for children; assistance for the poor, destitute, and elderly; religious education; youth and young adult ministry; global relief efforts of the Orthodox Church; and the missionary work of the Orthodox Church. About the Archdiocese: This section contains information on the Greek Orthodox Archdiocese of America, its history and mission, departments, ministries, institutions, and organizations. This section also features official documents of the Archdiocese, PDF copies of the Archdiocese yearbook and the Clergy-Laity Congress web sites. The Archdiocese website is one of the most active Orthodox Christian web sites on the Internet, with nearly 80,000 page views each day. The Archdiocese website is made possible with a grant from the Archbishop Iakovos Leadership 100 Endowment Fund.